Are you struggling to get your head round ‘returning’ to work? Leaving Maternity Leave behind you and resuming work life where you left off? Are you wondering what it will be like to go back to the office and do the job you did if you can remember how the heck to do it? Not to mention all the stress concerned with sorting out child care and organising the life that exists around work. In a minute I’m going to tell you why it’s impossible to return to work. I’m going to tell you why you can’t go back. Before I do, please have a think. Recall a work item, something that you only use at work. It could be your ID badge, a bag you only use for work. Your suit or uniform. Get it in your head. Actually locate it if you have time and look at it. Remember what it was like to use that item and be that person. Imagine where you sat and what you did, who you talked to. Some of the language you used and how you felt at work. Now look at an item in your home that you’ve only needed since you had a baby. It could be a high chair, a muslin, a bottle of Calms!!!. Think about times you have used this item and how those occasions make you feel. Depending on your job it’s probably worlds apart. You have a different life to the one you had when you were working. Even if you had a good work life balance. Chances are you’ve had to mute your hobbies for a while and life looks very different from how it did. How long have you been off for? 6-12 months? 5 years? Whatever the answer time has passed. Whatever you have left will not be the same. Clients will have changed, staff will have changed, furniture will have moved. Systems will be different. 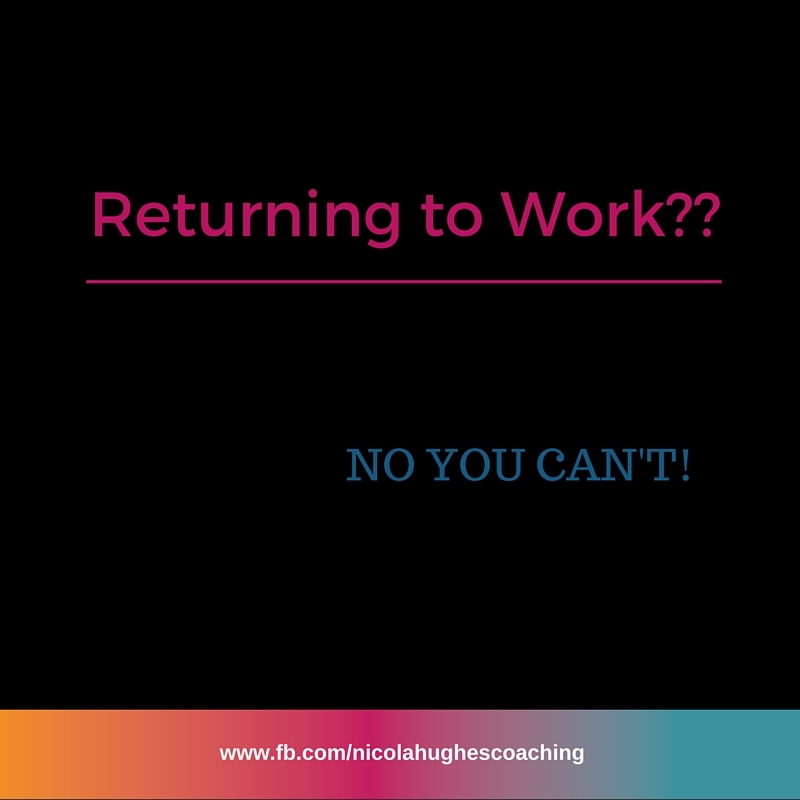 Returning to work makes it sound like you are going back to exactly what you left. But you can’t. You’ve changed and work has changed while you have been gone. There is no return. You cannot return to work. You can STEP INTO WORK. Just like work. It’s not going to stop, you are not joining at the same place you left, it has moved, you have moved. There’s going to be a jolt. Are you ready for the jolt? Over the next few weeks I will be running a fabulous FREE workshop called “Finding Your Feet as You Step in to Work”. Its aim is to help you with the jolt as you step in to work, raise your confidence and give you yummy cake and a FREE goody bag. See www.facebook.com/nicolahughescoaching for more information on how to book your place, there are a few places left but be quick. And if that wasn’t enough all of you that attend will have the opportunity to sign up to my FREE eBook with 6 Simple Steps to get you work ready and to minimise that jolt. You can’t return to work but you can step into it. The great thing is you don’t have to look back. You can be the new you and step into a great life, different from before, different from now but great. Next All Self Care Advice is Crap!